There's a local bullish 'Engulfing', which has been formed at the last local high. So, the market is likely going to test the next resistance at 1.1836, which could be a starting point for a bearish correction. The 55 Moving Average has acted as support once again, so we've got a 'Hammer' pattern on this line. In this case, after a short break, bulls are going to deliver a new local high. There's a 'Double Bottom', which has been confirmed, so the price is consolidating under the 89 Moving Average. 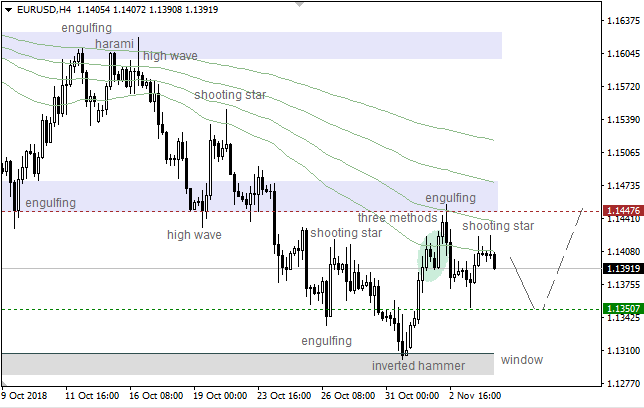 It's likely that the pair is going to test the nearest resistance at 1.3113 - 1.3146 in the short term. 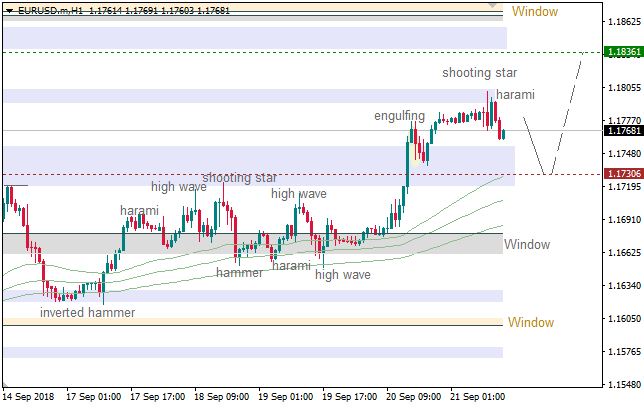 A pullback from this area could lead to another decline towards the next support at 1.3047 - 1.3032. We've got a 'Flag' pattern, which has been broken. So, after a short break, the market is likely going to test the closest important resistance at 1.3109 - 1.3149. If a pullback from these levels forms next, there'll be time for a bearish price movement in the direction of the last low. The pair is consolidating above the 55 Moving Average line. Also, there's a 'V-Bottom' pattern, which has been confirmed. So, we should keep an eye on the next resistance at 1.3089 - 1.3103 as an intraday target. A pullback from this area could lead to a downward correction. The last 'V-Top' pattern led to the current consolidation. 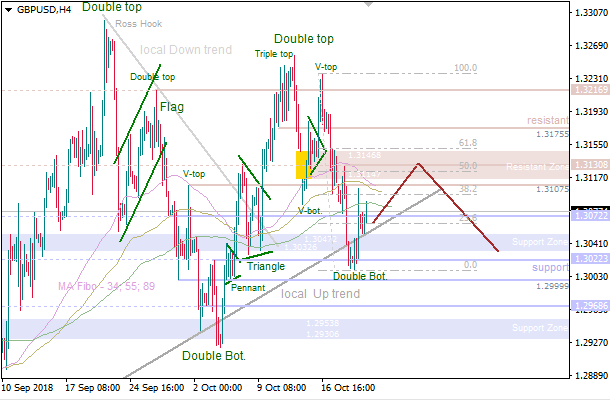 It's likely that the price is going to test the nearest support at 1.2953 - 1.2930. 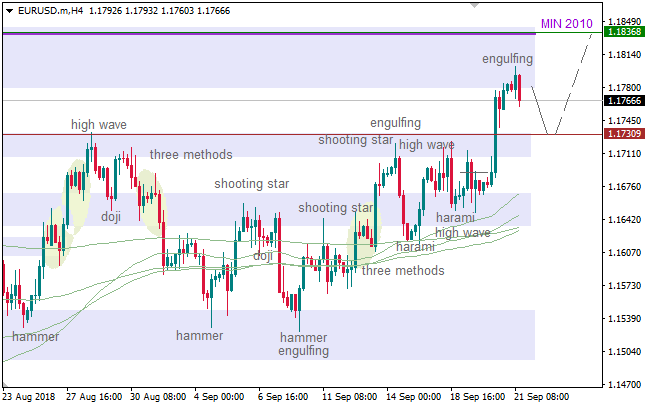 The following pullback from this target could be a starting point for another bullish rally in the direction of the closest resistance at 1.3073 - 1.3089. 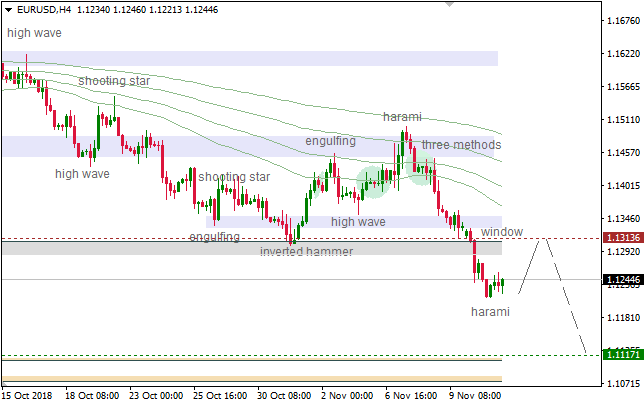 The 34 Moving Average is acting as resistance, so there's a 'Shooting Star', but confirmation of this pattern is weak. In this case, we should watch the nearest support at 1.1350 as a possible departure point for a bullish price movement towards 1.1447. We've got a bearish 'Engulfing', which is about to be confirmed. 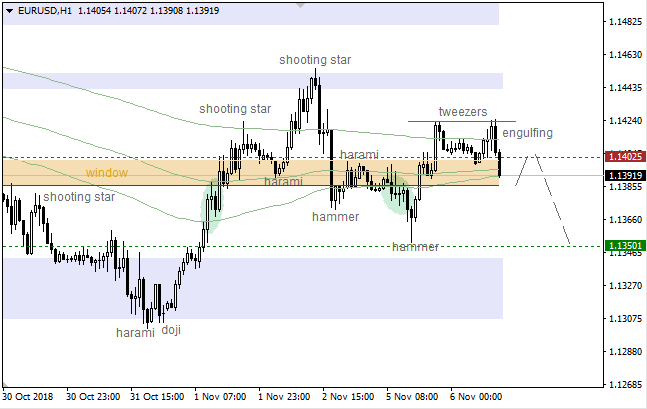 So, after a short break, the pair is likely going to reach the nearest support at 1.1350. If a pullback from this level happens next, there'll be time for another upward price movement. 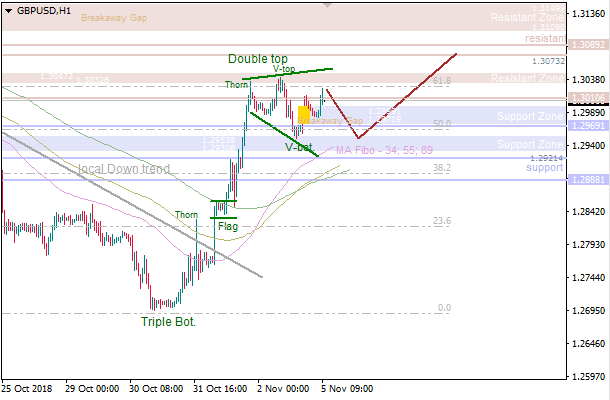 On the daily chart of GBP/USD, the pair may test the diagonal resistance (the upper boundary of the downward channel). 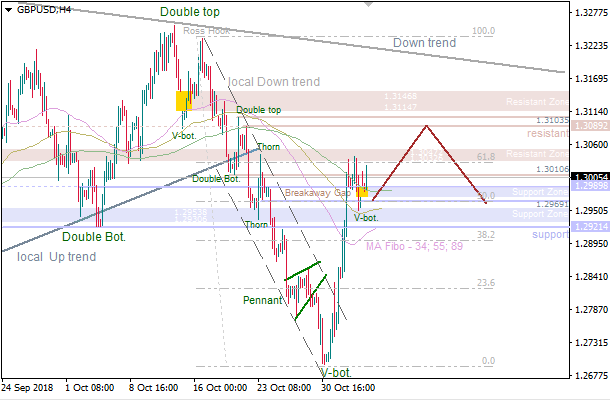 If bulls succeed, the pair will reach the 1.327-1.3315 convergence and the "Double bottom" pattern will be implemented. There's a bullish 'Hammer', which hasn't been broken yet. So, the pair is likely going to reach the nearest resistance at 1.1386. If a pullback from this level happens next, bears will probably try to test the lower 'Window'. 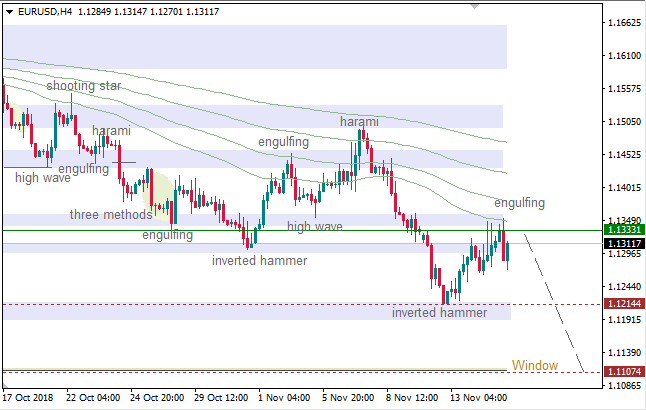 We've got a bullish 'Inverted Hammer', which has been confirmed. The main intraday target is the upper 'Window', which could be a starting point for another decline towards the next support at 1.1300. There's a 'Harami' pattern, which has been confirmed. So, the pair is likely going to test the upper 'Window' (1.1313) within the next few hours. 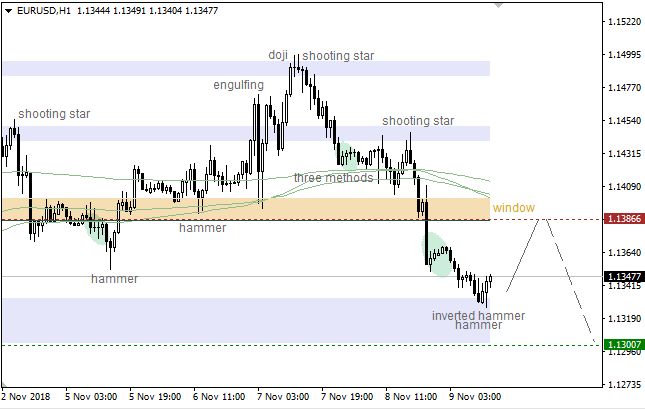 The following pullback from this level could be a starting point for another decline towards the lower 'Window' (1.1117). There's a pullback from the upper 'Window', so we've got a 'Harami' pattern. 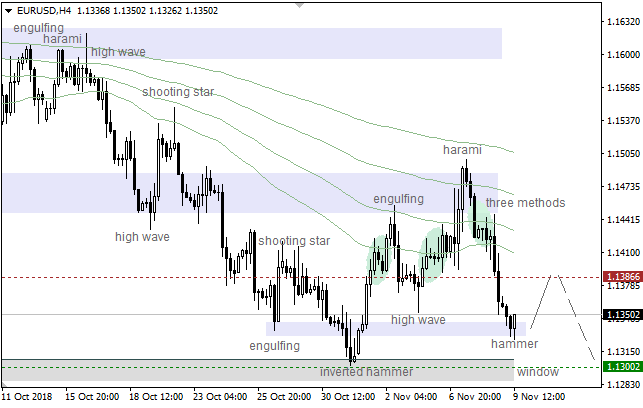 In this case, we should watch the next support at 1.1117 as an intraday bearish target. This level could be a starting point for a bullish correction. Last edited by pedagoreng; 11-14-2018 at 07:02 AM. 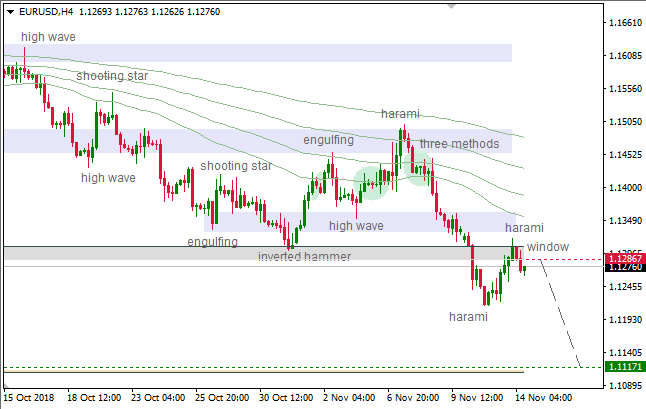 The 34 Moving Average has acted as resistance, so there's a confirmed bearish 'Engulfing' pattern. In this case, it's likely that the price is going to test the lower 'Window' (1.1107), which acted as support a few days ago.